This is part 2 in a 3-part series. In Part 1 of this 3-part post examining bar codes, magnetic strip readers, and FileMaker Go, we looked at the tools necessary to integrate all the components into one FileMaker Go solution. We will focus on just the bar code and FileMaker portion here. The necessary resources are listed in part 1, and the card reader portion will appear in part 3. To create the FileMaker Go app, we create the database up in FileMaker, and then place the app on the iPhone or iPad (via iTunes or web page, for example). Since the device is mobile and connection to a networked file can get iffy, there are advantages to having all the action local on the device, at least initially. Later, you can sync the data with the server though a variety of methods (GoZync, MirrorSync, etc). We created a simple test database (see demo file below). This file contains both the scanning and bar code reading capabilities. The database front end is fairly simple, and consists of a field that stores the data, plus three buttons. The Scan button handles a single scan, and could be set up for either pic2shop or CNS Barcode. 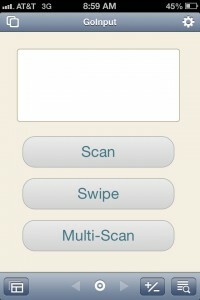 The Swipe button opens the CardSwipe reader app, while the Multi-Scan button works only with CNS Barcode. The last piece, the “Scan” script, handles the data received from the device. Since the barcode resides in the parameter, your script simply needs to insert the data into a field. Before looking at this script, we’ll switch over to see how CNS Barcode behaves. A simple Case statement checks whether we chose a single or multiple scan. Next, add the launchurl to the FileMaker database (the name of the file), and the ::bardode:: parameter (just like EAN for pic2shop). The Open URL calculation is broken down into respective parts, but really is one continuous URL. The Scan script itself places the barcode into a text field. With multiple data you would loop through and create multiple records. This script creates a new record for each scanned item. In theory once you have a valid barcode you can reach out to other databases and get additional information if required, or a custom barcode would be written to contain all the information that you need. Note the number in the red circle at the bottom. When scanning multiple items you can see how many are currently in memory. You can view the details by clicking on this icon. 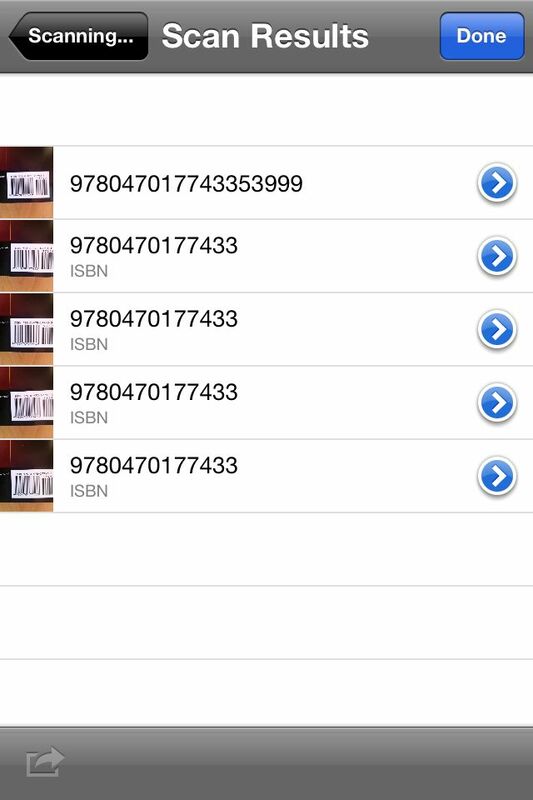 Note the first item in the list, which contains ALL the numbers from the barcode, including the smaller barcode section, whereas the others are all ISBN numbers. In your database if you are scanning books, you would need to validate the numbers before trying to pull additional information. Finally, when you click done, the app switches back to FileMaker via the callback section in the Open URL script step. 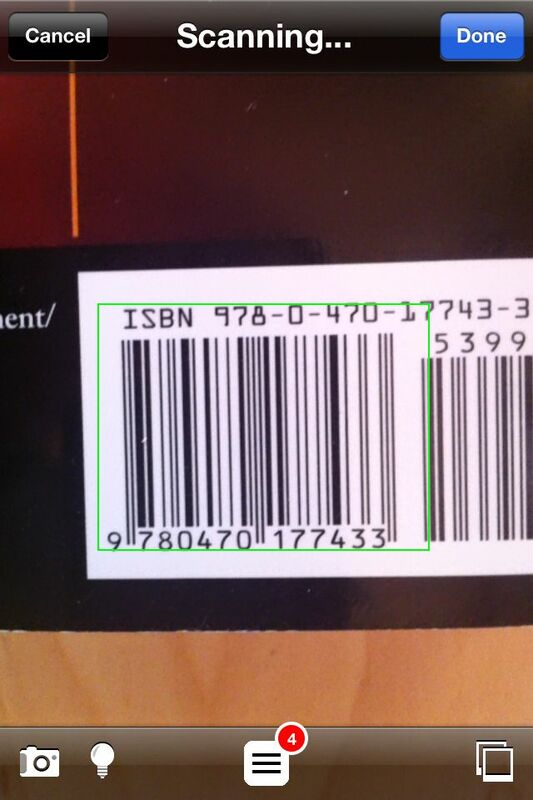 CNS Barcode’s multi-scanning action seems to quickly scan the same number multiple times, and also sometimes scans barcode numbers other than the ISBN10 or 13. Possibly there are some settings that might limit such behavior. Otherwise the multi-scan mode significantly speeds up getting that barcode data into FileMaker without switching back and forth between the apps. The sample file: GoInput.fmp12 applies also to the magnetic strip reading process in part 3. Hi Mauricio, did you take a look at the sample file? The scripts that I refer to in the article are in this open file. Thanks for your post. It is interesting and helpful. I’m developing a native iOS app in Objective-C. I wonder whether I can retrieve the records of Filemaker Go in my app with URL protocol. Not sure if I’m doing anything wrong or if this is a bug from pic2shop. I downloaded your sample file and stripped it down a bit to use only pic2shop, as well as use the data passed by pic2shop to do Finds or entering data. However, while everything works great with regular barcodes, when I scan QR codes, all I get back is “EAN” instead of the text itself. Theoretically this should be possible, but I’m not sure if the free version allows this. The product description for the Pro version mentions the ability to add optional formats, including QR codes: “…scan?formats=QR&callback…” (see http://www.pic2shop.com/pro_version.html ). However, when I try this with the free version, either it doesn’t work, or there’s something else going on. I’m currently working on a project for a Scout Jamboree in the UK. Trying to get pic2shop to bring back a QR code into FileMaker without much luck. Would be very grateful for any assistance, or feedback from our investigations. I’ve tried several variations for QR codes, and have communicated with the support group at pic2shop. They state it should work, by simply adding the QR string to the callback. However, so far I’ve also been unable to get this to work, though EAN works seamlessly. Thanks Anders for your blog. I emailed pic2shop and they said to change EAN to QR. It works for me, but I can’t figure out the right combination to get both on the same line. Isaac, that interesting. I tried using QR instead of EAN and nothing happened. I am able to get CNS Barcode to work for both EAN and QR codes, but no combination with pic2shop appeared to work for QR codes. Would be very grateful if Isaac could share his actual line of code he has managed to get pic2shop to work with QR’s in FM. If that’s possible?? Paul, the following is the command for QR I use. In my case the moment I add “QR” as the param instead of EAN, or even in addition to EAN, the script breaks. There is no callback to the script in the URL. The QR codes is scanned and then it jumps back to FileMaker, but fails to call the script. I have tried several variations, urlencoding manually or with the FMP calculation. In each case this breaks my script: param%3DQR. However, param%3DEAN works seamlessly. Hi Anders, my call back script is named FINDBarCodeScanAdd. Try replacing that with your script name in the url. Thank you for info, this unfortunately is exactly what my url looks like, but alas doesn’t work. Even replacing my string with the one you kindly supplied and changing the script name accordingly hasn’t resolved the problem. Back to the drawing board. Strange. Ok, so I went back and tested again. I’m using FMS Advance 12, to host the file. Are you using FM Server to host the database? I ran into some trouble getting the same test database to work if stored the file directly onto the iPhone. Seems I had several copies of the database in FMGo12 under “Files on Device”. Once I removed them all and pulled it back in from email it worked fine. Maybe that is you issue? I’m hosting my solution on FM Server, I haven’t tried hosted via FM advanced. Will try that and see what happens. Will be a real pain if it’s caused by being hosted on FM Server. Sorry I abbreviated. FMS Advance is FileMaker Server Advance. Not FileMaker Advance. If you want, I can upload my test file, but I don’t see an upload button here. I am hosting my file locally on the device. I can try it on a server and see if that makes a difference. Ideally this should work on a file local to the device, since the person scanning may not have internet access all the time. Changing the script name made no difference in my case. When I have QR in the string the scrip in the url fails to activate. I am checking into the server option. I tested your code on my iPad and it works great. Then I purchased the CNS Barcode and copied your code to my solution. The only thing I changed is the scan script to set one of field with the scriptparameter. However my solution did not work somehow: ipad stop at CNS Barcode and did not jump back to Filemaker solution. Could you tell what I did wrong? Thank you very much. I just found out that the password may cause the problem. When I leave the account’s password as blanc, it did return to the Filemaker solution. But I need to use the password for different users. In this case, how to modify the “Open barcode app” script? Thank you very much. Ryan, not sure why you need a password or login for this script. Is this just to identify the user? Can you not use something like Get( PersistentID ) from within FMP for this? my filemaker file is on the FMS 12 and is password protected, how can i add the account name and password in the url itself so that i don’t have to type account name and password when the app switches back to filemaker? I also have my Filemaker file password protected. It does not ask me for a account name and password when I switch back. Does your account use the fmreauthenticate extended privilege? It would appear the scanning and call back function is stingily affected by solutions that have any form of security placed on them. I have placed this functionality in several solutions that are ‘open’ with no issues. As soon as I place this in solutions that have different types of accounts it will not perform the call back script. I’ve tried having the scripts set with ‘run with full etc’ and this makes no different. Would love to know if some one could shed some light. By open, do you mean the default admin account with no password? Or, does open mean running the process from one file calling another that’s not open? Since the database is open when you call the iOS app, it should find that open file and run the callback script. I meant ‘open’ as in admin account no password. How do return the scanned data back to FMP? I click on scan and pic2scan opens and I can scan a barcode but I can not figure how to exit pic2scan and return to FMP. Jim, the “scan button” script should do two things. It uses the script step “Open URL” which uses what’s allied a URL protocol to open pic2shop. In the URL there is an action—scan—with a callback to FileMaker using the FMP url protocol. This callback should have the file name and the name of the FileMaker script. In my example this script is called “Scan.” The script takes a parameter: EAN; the barcode being scanned. very nice article, thank you, i decided to give it a go. I noticed that the downloaded file is opening somewhat slow on the PC, is there a particular reason for this, as it is a very small file with no data in? It opens almost instantaneously for me on both Mac and Windows. The file is very small and requires no plugins. I have an iPad 2, OS6, I believe. I copied your GoInput database sample, disable the CNS barcode script step since I would have to purchase the app and I am just testing now. Nothing happens when I click/press on the SCAN button. Do I have to download a pic2shop app to be able to run the script? 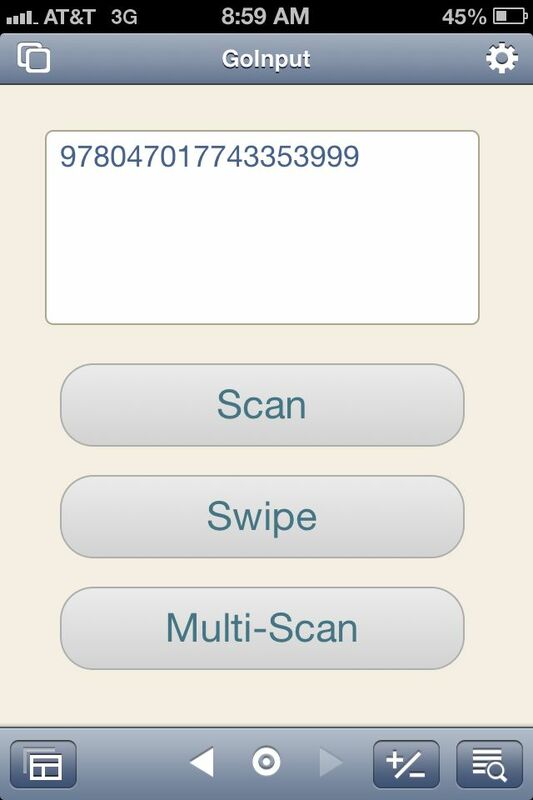 Isabella – If you have FileMaker Go 13, use the Insert From Device script step to scan a barcode directly from the app. See this article for more information. 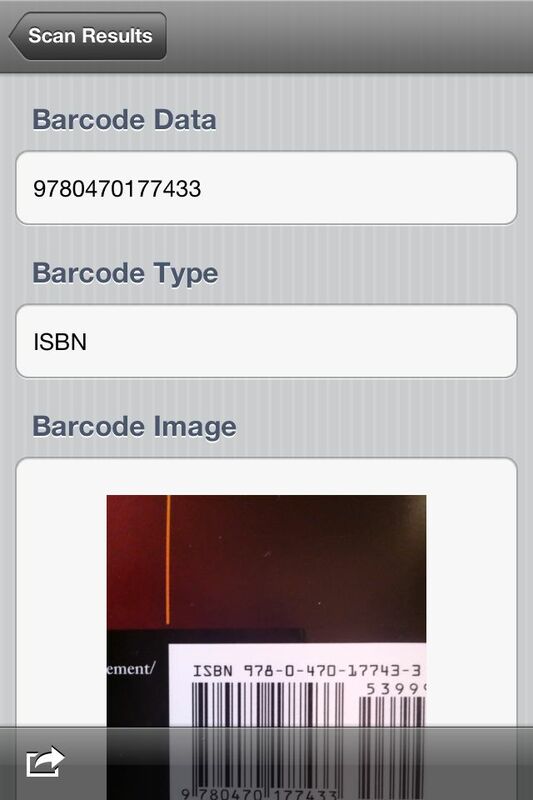 If you have FileMaker Go 12 or earlier, you will need either pic2shop or CNS Barcode to scan a barcode. Also, the poor camera quality on the iPad2 makes it more difficult to scan a barcode.